Now that Christmas has come and gone we are often left with the question of how to decorate until spring. It’s not quite time to break out the Easter decor, and it’s still really cold in most of the country, so I decided this year to decorate some areas of my home with a snowy winter white. 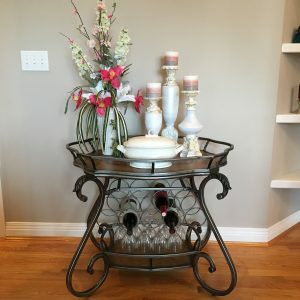 Today we will look at how I changed out the wine cart to a winter white hot cocoa bar. Since the budget is not unlimited, I tried to reuse items where I could. Obviously you will want to remove anything with Santa or Christmas trees but I really think the key to reusing some of your Christmas items while making the area look fresh and not as if you forgot to take down your Christmas decor is to remove any items which are red, green, and gold. I love this cute little snowman dressed in a white sweater. It can be really difficult to find wintery decor which doesn’t look Christmasy, but I’m confident you can do it. Disclaimer: We are a participant in several affiliate programs including the Amazon Services, LLC Associates Program, an affiliate advertising program designed to provide a means for us to earn fees by linking to Amazon.com and affiliated sites at no additional cost to you. Keeping with this idea, I even switched out the peppermint sticks for a peppermint syrup. This way you can still add peppermint to your hot cocoa without the very Christmasy look of candy canes. 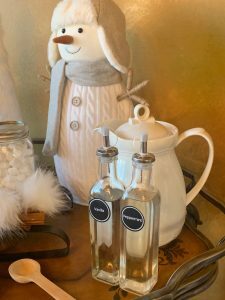 The labels for my peppermint and vanilla syrups can be found here. The white pitcher will hold hot water to be used to make instant hot cocoa. If this were for a party or gathering I would whip up a batch of crock-pot hot cocoa, but since I plan to leave this out all season, simply keeping hot water is the pitcher is a much more doable solution. The white pitcher I used is one that matches my everyday china and I have had for years, but a similar one can be found here. 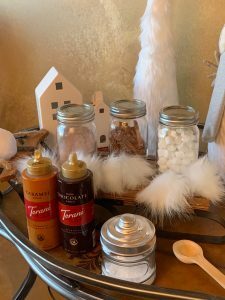 The mason jars hold mini marshmallows, cinnamon sticks and instant hot cocoa powder. The glass dispensers are vanilla syrup and peppermint syrup – which I wasn’t able to find in a store so I made myself from peppermint extract, sugar, and water. I purchased my dispensers at the Dollar Tree, thought I really love the coffee house look of these even more. The two squeeze bottles are dark chocolate and caramel. The tiny container in front contains sea salt for salted caramel hot cocoas – I purchased this container from Dollar Tree also. The wooden spoon is part of my canister set, but it’s the perfect size for measuring out your hot cocoa mix. 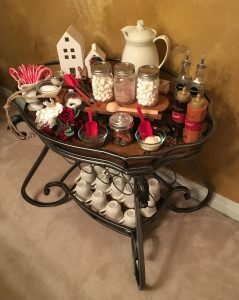 Here’s the Christmas version of my Hot Chocolate bar. As you can see, there are many more red accessories, and even candy canes to give the original version a definite Christmas vibe. Just for fun, here’s a view of my bar cart as it is most of the year. To see how I updated the white candle sticks, please click here. Thank you for reading. 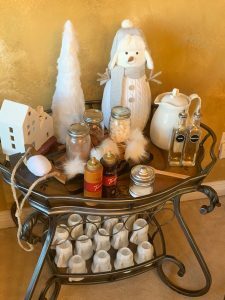 I hope you have enjoyed seeing how I reused many of my Christmas decorations to create this fun and fresh hot cocoa bar. I’m hoping the snowy look of the decor will help keep the Christmas magic alive in my home throughout the dreary winter months.